Stylish Star Allu Arjun is emerging as most successful hero in Tollywood. He is enlarging his market value for each new film. He is the only star hero who have hat trick blockbusters in recent times.Bunny’s latest outing Sarrainodu is doing wonders at box office even in its third week.The film directed by Boyapati Sreenu. Sarrainodu has beaten several records. Sarrainodu has become highest grossing Telugu film of 2016. And it is biggest earner in Allu Arjun and Boyapati’s careers too. The film has already stands next to Baahubali in Vizag (Utthara andhra) and in 3rd place at East Godavari.In history of Rayalaseema (Ceded) only 3 films have crossed 10cr mark in Ceded.Now Sarrainodu joins the club. The mass action entertainer has now achieved another milestone. With crossing 103crs gross Sarrainodu is now 5th biggest blockbuster in the history of Tollywood. Sarrainodu raked around Rs 52 crores alone in Telugu states. Sarrainodu dream run will continue for few more days, since the film is catering pleasurable elements for all age groups. 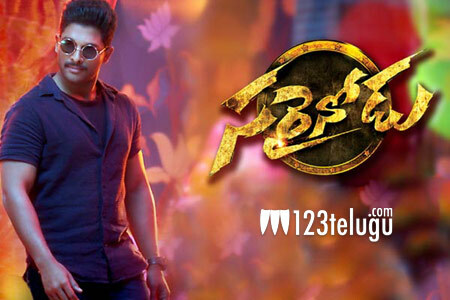 Expectations were sky high on Sarrainodu, before the release. The movie has reached all the expectations after the release and the box office performance is the proof. Congratulations entire team members of Sarrainodu for the massive hit.